Are your fingers itching to try out the ultimate in next generation gaming laptops? Between 6-10 March, MSI will be exhibiting its GT60, GT70, GE60, and GE70 next generation gaming NBs in its CeBIT 2012 booth (Hall 14, H30) in Hanover, Germany. Other machines slated to be on display are MSI's latest U270 notebook and the U180 netbook, gorgeous machines characterized by high performance and high mobility, as well as the Windpad 110W tablet with latest Windows OS. Hanover—Focused on developing its own high tech brand name, MSI Notebook's steady stream of innovations has enabled it to break one world record after another. For example, MSI G Series gaming notebook computers that were tested at the recent IDF Forum organized by Intel in Beijing racked up over 20,000 points on the PC Mark . Soon afterward, the GT780DXR was awarded Innovations Honorees at CES 2012. 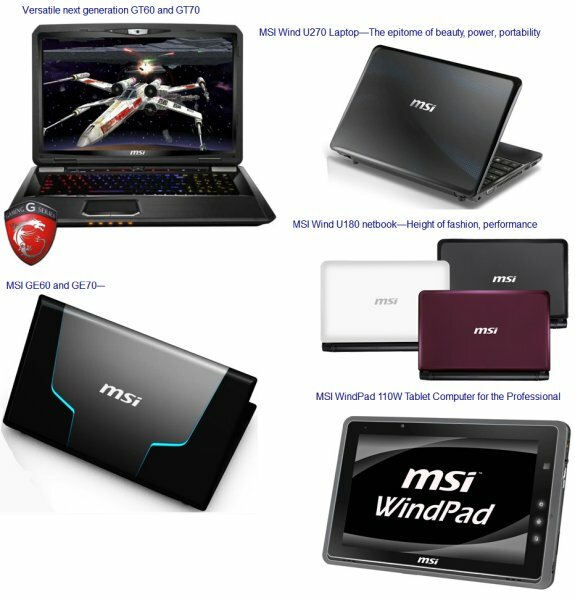 Now, MSI is introducing the GT60, GT70, GE60, and GE70—the ultimate in next generation gaming notebooks. They feature Intel's next generation top-of-the-line quad core processors and the nVidia new generation discrete graphics card—the fastest one of its kind on the planet. Specially designed to meet the extreme demands of extreme gamers around the world, these killer notebooks also boast awesome peripherals. Eric Kuo, associate vice president for global sales, MSI Notebook, points out that MSI's soon-to-be-rolled-out, next generation of versatile gaming NBs—the GT60, GT70, GE60, and GE70, are the top battle laptops on the planet today and are the top choice of top players around the world (Top player, top choice!). Not only do they feature powerful next generation processors and discrete graphics cards, they also come with unparalleled peripherals, such as professional Steelseries keyboards and Hollywood cinema grade THX TruStudio Pro wrap around sound technology to meet the needs of serious gamers the world over. And to satisfy their 3D gaming needs, in addition to GT70's keyboard backlighting visuals with more than 1,000 variations, the GT60 and GT70 also have second generation Dynaudio sound technology, industry-leading professional grade Bigfoot Gaming LAN card, and up to 32G of memory. Now, equipped with your MSI G Series gaming laptop, you have all you need to be victorious in battles against foes no matter where they lurk in the known universe. MSI has continued to roll out awe-inspiring, high-end notebook computers for extreme gamers. During CeBIT 2012, the firm will unveil the ultimate in next generation gaming laptops—the GT60 and GT70. Under the hood, you'll find unmatched next generation quad core processors and nVidia's fastest top-end discrete graphics card. They also offer gamers a smooth 3D gaming experience and sport the highly anticipated Bigfoot Gaming LAN professional-grade gaming card, second generation Dynaudio sound technology, THX TruStudio Pro smart wrap around sound, high-end professional-grade SteelSeries keyboards, and WiDi technology. These laptops pack everything you need to root out the bad guys from our universe. Starfighter design, superior visuals: The new generation GT60 and GT70 extreme gaming laptops were meticulously designed by MSI with popular starfighter concepts and elements incorporated into every detail and set off by the brush finish of the aluminum chassis to offer extreme machines for extreme gamers. The GT60 features a 15.6-inch and the GT70 a 17.3-inch full HD screen and MSI's own Cinema Pro technology to further enhance picture quality for crisper images and richer colors for an unprecedented visual experience. Superior hardware and processor and display processing: MSI's new generation GT60 and GT70 starfighter gaming NBs pack Intel's latest quad core processor and nVidia's newest generation, high-end discrete graphics card as well as the most advanced hardware architecture in history as well as MSI's TDE overclocking technology. When running resource-hungry 3D graphics, simply depress the Turbo hotkey above the keyboard to instantly throttle up system performance. The graphics display overclocking automatically kicks in system overclocking to give you crisp, vivid pictures, smooth graphics and awesome 3D pictures regardless of how complex they are. Second generation Dynaudio offers top-quality sound: MSI worked in close collaboration with specialists at Denmark's world-renowned sound system designing firm Dynaudio to further enhance Dynaudio sound technology. Vast amounts of study and countless calculations went into determining ideal speaker locations to obtain obstruction-free sound transmission. MSI employed Gold flash audio jack, the best (and most expensive) conduction material in the world, in its sound I/O ports. The gold provides cleaner, crisper sound and reproduces stereo more precisely, while enhancing anti-oxidization, transmission efficiency, and noise reduction. The GT60 and GT70 even offer the serious gamer the best possible audio experience in the form of pure, obstruction-free sound through external stereo speakers or earphones. In addition, the THX TruStudio Pro smart wrap around sound, heretofore only found in high-end cinemas, enables the GT60 and GT70 laptops to reproduce various kind of music in any frequency band. Unparalleled professional-grade SteelSeries keyboard: MSI has heard your calls for equipment designed with the gamer in mind. As such, we got together with SteelSeries, the leader in gaming peripherals, to create a new generation starfighter-grade keyboard for the MSI GT60 and GT70. And the GT70 can lets you choose from among five keyboard backlighting scenarios—Normal, Gaming, Wave, Breathing, and Dual Color, that can be used in coordination with variable section lighting, and seven colors offering over 1,000 variations. Gamers will also appreciate the fact that when you depress the Gaming Mode hotkey, the frequently used W, A, S, D, and Ctrl keys located on the left side of the keyboard are all backlit in LED while the rest of the keyboard stays dark. This allows you to quickly find the key you're looking for, so you can remain focused on the rapidly changing melee you are in, giving you that extra edge you need to come out on top. Bigfoot Gaming LAN: Nothing is worse than losing to opponents in online games, because of slow transmission speeds. The record-breaking, new generation MSI GT60 and GT70 gaming laptops come equipped with Bigfoot Gaming LAN to give you blazing online transmission speeds that are not just faster… they can be as much as 16 times faster (see illustration below) to keep you way ahead of the game! The GT60 and GT70 also come with the newest USB 3.0 which transfers data at up to 4.8Gbps—10 times faster than USB 2.0, so a 25GB HD video can be transferred in just 70 seconds. It also recharges devices 80% faster. Now, your external hard drives, thumb drives, and various handheld devices transfer data and recharge much faster. 32GB of memory: New generation MSI GT60 and GT70 gaming laptops come equipped with four DDR3 memory slots to give you an incredible 32GB of memory. In addition, the RAID 0 accelerated dual hard drive architecture doubles hard drive memory and instantly increases hard drive read speeds, more than enough to meet the needs of battle scenes and other complex graphics. The MSI GE60 and GE70 boast the most advanced hardware of any next generation gaming notebooks and are expected to steal the show at CeBIT. They pack Intel's latest quad core processor, nVidia's top-of-the-line discrete graphics card with 2GB GDDR5 of display memory, the high-end SteelSeries gaming keyboard, and THX TruStudio Pro smart wrap around sound. These machines give serious gamers around the world powerful processors and displays and an awesome light and sound show to give you the edge when you take on the bad guys. Fast futuristic starfighter: Streamlined and built for speed, the exteriors of MSI's new generation GE60 and GE70 gaming laptops resemble starfighters. The metal chassis is sheathed in the latest laser-etched Color Film Print which is not only translucent, it protects against scratching and wear, while adding a touch of class. Reminiscent of leopard eyes, the lines further set off the metallic luster. Respond to the battle cry by taking your futuristic 15.6-inch GE60 or 17.3-inch GE70 into the fray. Unequaled professional-grade SteelSeries keyboard: Responding to the call of extreme gamers, MSI worked side by side with leader in gaming peripheral design SteelSeries to provide the GE60 and GE70 a keyboard designed specifically with gaming in mind. It lets you choose from among five keyboard backlighting scenarios—Normal, Gaming, Wave, Breathing, and Dual Color, that can be used in coordination with variable section lighting, and seven colors offering over 1,000 variations in visual effects. Gamers will also appreciate the fact that when you depress the Gaming Mode hotkey, the frequently used W, A, S, D, and Ctrl keys located on the left side of the keyboard are all backlit in LED while the rest of the keyboard stays dark. This allows you to quickly find the key you're looking for, so you can remain focused on the rapidly changing melee you are in, giving you the extra edge you need to come out on top whether you're battling foes in some other galaxy or right here at home. Top-of-the-line cinema-grade sound technology: MSI's GE60 and GE70 gaming laptops feature THX TruStudio Pro smart wrap around sound which offers performance heretofore available only in cinemas. It works in tandem with the cutting-edge speakers, so that the MSI GE60 and GE70 reproduce each and every sound faithfully, regardless of music or sound type. Full array of HD features: MSI's GE60 and GE70 starfighter laptops are equipped with a full HD 16:9 wide screen that offers bright colors without those pesky black strips at the top and bottom of the screen when you watch films. The HD720p webcam allows you to enjoy smooth, bright high fidelity web calls with friends and family. If you want something bigger than a high definition computer screen for viewing films, the MSI GE60 and GE70 starfighter gaming laptops also come with an HDMI port, so any type of high-fidelity, high-definition video can be played on your NB, but viewed via a cable on a large-screen LCD television. MSI's TDE overclocking technology: MSI's new generation starfighter GE60 and GE70 gaming NBs come with MSI's own TDE (Turbo Drive Engine technology), so when you're running resource-hungry 3D games, overclocking kicks in automatically to instantly rev up system speeds. The GE60 and GE70 also include MSI's Cooler Boost technology. Simply depress the glowing hotkey above the keyboard to switch on the powerful cooling capabilities to immediately reduce system temperature and increase system stability. The Wind U180, meticulously crafted by MSI for 2012, marks a new zenith in computer technology. The smart looks, gale-like performance, and feather-light weight can best be described with the phrase "Ride with the wind." It comes in minimalist black, angel white, or lavender, is less than one-inch thin, tips the scales at just 1kg, and is sheathed in MSI's own attractive IMR color film print to prevent scratches and smudges. Let this highly mobile piece of computer technology add color to your life. Intel's Atom processor: The stylish MSI Wind U180 netbook comes optional with the new generation dual-core Intel Atom N2800 processor with advanced 32nm-based processor which works in conjunction with the Intel NM10 high-speed chip set. It not only effectively enhances processor and overall system performance by more than 20% over previous generation netbooks, it also supports DDR3 system memory, while using much less power than the earlier platform. This new generation netbook brings high performance under the hood of a lean, mean, beautifully constructed machine. Ultra thin, ultra light netbook with chic chassis: MSI's ultra thin, ultra light Wind U180 sports a unique round display axle. It comes in three colors—minimalist black, angel white, and lavender, and the exterior is sheathed in stylish anti-scratch, anti-wear IMR coating. The Wind U180 features an attractive chiclet keyboard, palm rest areas protected by a tasteful clear film, and a touchpad with distinctive etched concentric circle design to give the keyboard area a stylishly minimalistic look while increasing finger friction coefficient, so the cursor glides more smoothly. These elements converge to make the MSI Wind U180 the stylishly gorgeous piece of high tech art that it is. All-new media engine: The MSI Wind U180 utilizes latest generation display graphics technology, enabling it to play high resolution 1080p movies and it supports digital display and conferencing capabilities, such as HDMI. The internal Intel Graphics Media Accelerator works in conjunction with the integrated memory control to boost performance and system response. Display graphics performance is double that of the previous generation platform. You can watch movies or hook it up to an HDTV without compromising picture quality. MSI TDE overclocking technology: The MSI Wind U180 comes with MSI's own epoch making TDE overclocking technology to speed up the processor clock, instantly throttling up performance. It optimizes the hardware which works in coordination with up to 2GB of DDR3 system memory to provide you a light, fast computing experience. MSI's ECO power saving technology: MSI's exclusive ECO engine power saving technology allows you to select from among five power management levels—Video Game, Film, Presentation, Word Processing, and Turbo Battery, with the touch of a finger, so you can effectively extend battery power time 33% over the previous generation. Tests show that the 6-cell battery can power the MSI Wind U180 for 8 hours to give you all the power you need for the entire day. *Actual battery time will vary with differences in computer use and settings. MSI's 12.1-inch Wind U270 laptop computer features AMD's latest generation dual core Brazos platform processor, USB 3.0, HDMI port, and HD720p webcam. This highly mobile machine offers everything you need in a notebook computer and performance on par with discrete graphics card-packing computers. With this ultra light, ultra thin beauty in your hand, you'll "ride with the wind." AMD's new generation APU: The Wind U270 packs AMD's 2012 new generation dual core processor with Brazos platform. This APU (Accelerated Processing Unit) comes with x86 architecture cores which support DirectX 11, offering powerful processing and display performance on par with discrete graphics cards. Classy gradated coating: With its subtle gradated checkerboard design, the cover of the Wind U270 exudes an artistic feel, while the layered tones accentuate the unparalleled elegance of this chic machine. In addition to giving the U270 a character all its own, MSI's color film print protects it against scratching and wear. The Wind U270 also comes with an attractive independent Chiclet keyboard for a nice, solid feel when you type. USB 3.0: MSI's Wind U270 comes with new USB 3.0 ports which boast transfer speeds of 4.8Gbps—10 times faster than USB 2.0, and 80% faster power transmission, providing vastly higher data transfer rates and charging speeds for external hard drives, flash drives, and other handheld electronic devices. HDMI and HD720p webcam: The MSI Wind U270 comes with a cinema-class 16:9 ratio LED display, which not only offers richer colors, but doesn't have those pesky black strips at the top and bottom of the screen when you watch HD films. The U270 laptop also comes equipped with an HD720p webcam to give you rich, smooth, clear pictures when conferencing with friends and family. If you like watching HD films on something larger than a computer screen, the U270’s HDMI slot lets you connect to LCD TVs. ECO engine power saving technology: MSI's exclusive ECO technology allows the user to extend battery life with one touch. You can choose from among five power management scenarios—Video Game, Film, Presentation, Word Processing, and Turbo Battery, effectively maximizing battery life. Tests show that the MSI U270 can run up to 8 hours on a single charge. *Actual battery time may vary with differences in computer use and settings. MSI introduces the WindPad 110W—the ultimate tablet computer, featuring Windows 7, the highest-compatibility operating system, and AMD's powerful new generation Brazos processing platform. This tablet represents the ideal combination of hardware and software, so that businesspeople can do what they do anytime, anywhere to Connect your life without being held back by hardware or incompatibility issues. And when you're between pressing matters, you can kick back and enjoy some multimedia entertainment on your 10-inch, 1280*800, rich color, multipoint touch-control screen with wide view angle IPS design and SRS wrap around sound to give you the ultimate mobile entertainment experience. AMD new generation APU processor architecture: MSI's WindPad 110W features AMD's latest dual core Brazos platform processor. The APU (Accelerated Processing Units) processors come with x86 architecture cores and the AMD Radeon™ HD 6250 Discrete-Class display chip. It supports DirectX 11 for super powerful processing performance and display performance that that gives discrete graphics cards a run for the money. The WindPad 110W boasts a power-sipping, environmentally friendly processor that uses only 5.9 watts and MSI's own ECO engine power saving technology, giving you more than six hours of battery time—the most of any tablet with Windows architecture. Superior hardware for a superior professional mobile work platform: The MSI WindPad 110W boasts a stylish yet unpretentious exterior with artistic brush finish, and platinum trim—ideal for the professional. The back is sheathed in MSI's own color film print to protect against scratching and wear, while adding a touch of classic style. But the WindPad 110W isn't just another pretty face. The superior hardware, including up to 4GB DDR3 of memory, 802.11 b/g/n wireless, Bluetooth, G-Sensor, ALS (ambient light sensor), an SSD hard drive that maxes out at 64GB, and a total weight of just 850 grams, makes this the ideal mobile work platform. Complete array of I/O ports: The WindPad 110W tablet computer comes equipped with a complete array of I/O ports, including an SD card reader, USB port, and mini HDMI slot, supporting the largest number of external devices, from printers and projectors to mouses, keyboards, and flash drives. And if you’re looking to kick up your multimedia experience a few notches, you can connect your tablet to any size HDTV screen or surround sound stereo.